I’ve been trying to do something since last June and finally accomplished my goal today, 4 months and 3 days before my deadline. Namely, to shoot my age on a 9. I’ve done it before, but it was at a course where the back side was par 35. 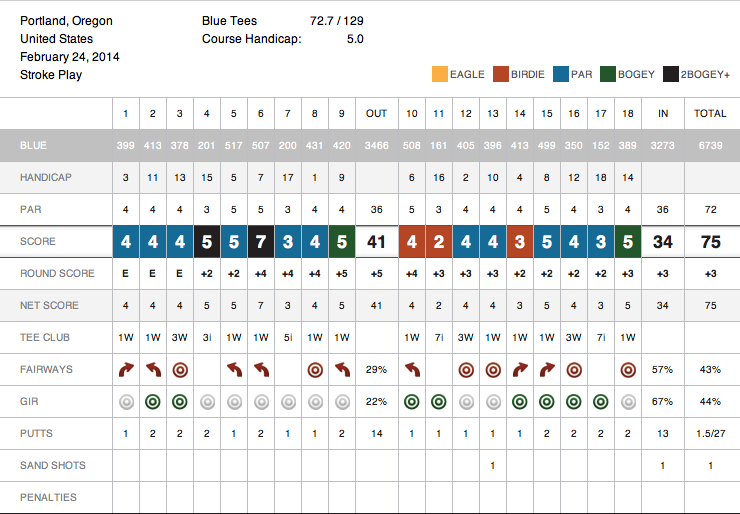 What I wanted to do was to shoot a 34 on a par 36 9. Today, I finally reached that mark and still have until late June to do it again, and again. I would like to do a hole-by-hole recap as I have not done one of those in ages and might as well on one of the better rounds like today. Before I start, though, the realization I had with my putting was that I was doing it too much with my hands and not rocking my shoulders enough, which had been leading to slight pushes and pulls that were keeping the ball out of the hole from anything over about 6 feet. I also found a “feel” in my swing which on the range was producing longer and straighter shots, although my irons were still far from consistent today and a focal point in the immediate future. Hole 1, par 4: Straight away hole. I pulled the drive to the right side rough and was blocked by a large tree that didn’t allow for a line on the green. I punched out to a good number then hit my 50 degree from 110 yards to about 6 feet. Made the putt for par. Hole 2, par 4: Tried to hit a baby fade on this dogleg left hole but the wind was cutting across and it ended up clipping a tree and landing short left in the rough. I had to hit a low shot under some branches with a lot of cut, so from 185 yards I pulled my 3-hybrid and stuck the green, two-putting from 20 feet for par. Hole 3, par 4: Hit one of my better 3-wood shots drawing down the middle of this dogleg right and had 104 yards remaining. I hit a good 54 degree wedge that landed about 10 feet short of the pin, but the green slopes from back to front and I caught it clean so it zipped back about 10 more feet. Two-putted for par. Hole 4, par 3: The pin was tucked behind a bunker and about 190 yards away. I tried to fade a 3-hybrid into the green with the goal being to stick it in the middle, but made a bad swing and it over-cut into a tree on the left. The ball came straight down and landed at the base of the tree without any shot for the green. I had to punch out backwards then hit a flop shot from 30 yards over the bunker. The shot landed where I wanted it to but rolled out to about 12 feet. Lipped out the bogey putt and had to tap it in for double. Total bummer. Hole 5, par 5: Dogleg left. Driver went down the left side ending up about 2 feet from the fairway but in the rough. I hit a good 3-wood to 60 yards, which is the perfect distance for a half 58 degree, but I caught it a little fat and it ended up just short of the green. I chipped up to the hole then tapped in the par putt. Hole 6, par 5: I tried to fade it on this 90 degree hard dogleg left but made a bad swing and pushed it deep into the trees. On the next shot I tried to hit an 8-iron to get over some trees and back into the fairway, but it clipped the top branch and fell straight down with about 150 yards remaining to the hole. I was blocked by one tree and had some overhanging branches so attempted a low cutting 6-iron that would run up to the green. Unfortunately, it hit a branch hard and came straight down with about 140 yards remaining. I had to hit the same shot or punch out so decided to take my medicine (finally) and punch out. The ball ended up 40 yards from the green and I flopped it on then proceeded to 2-putt from about 20 feet. I had tried to play it smart with the 8-iron to start, but sometimes things just don’t go the golfers way. Another double. Hole 7, par 3: Hit a 5-iron pin high, but about a foot off the green in the rough. Chipped to a foot and made the par putt. Hole 8, par 4: Finally hit a fairway with the driver. This is a longer par 4, especially when the ball plugs and into the wind so I had about 185 remaining. I hit a 3-hybrid that faded too much into the rough, but it was an easy flop-chip and an even easier tap-in putt for the par. Hole 9, par 4: I pushed the driver pretty hard left into the trees and had to punch out to 115 yards. I tried to hit a small wedge to lessen the winds effect and it came down a bit short. 2-putted from 20 feet for the bogey. I turned at 41, or 5 over, and was not a happy camper. It was really two holes that were keeping me from a decent round and I vowed at this point to not have any more blow-up holes. I walked pretty slow to the 10th tee, to allow myself to refocus, and then was ready for the back side. Hole 10, par 5: Slight dogleg right. My drive came down on the left side a little short, popped it up some and had 300 yards remaining. I hit a 3-wood as ever since I got the new one it has become my go-to club and ended up in the middle of the fairway with 70 yards remaining. Determined to not leave it short I hit a nice little 58 degree to 5 feet and hit a solid straight birdie putt. Hole 11, par 3: Riding the confidence from the tenth hole I had envisioned a hole-in-one here, but the ball landed just short of the hole 150 yards away and spun to the left (I tried to hit an easy cut 7 to hold up against the wind). I made another 5 foot birdie putt, which got me pretty excited. Hole 12, par 4: This hole is a hard dogleg left and from the tees if you hit a driver straight you end up OB long, so I pulled the 3-wood and cut it nicely, matching the shape of the hole. I then had 148 yards remaining so pulled the 7-iron again and tried to put on the same swing as the previous hole: a little knock down cut. I swung with only arms, though, and ended up drawing it into the rough on the right side. My chipping was solid today and the ball landed about 4 feet from the hole. Made the putt for the par. Hole 13, par 4: This is a shorter hole with a decent dogleg right. I pulled the driver and made a good swing at it and ended up with just 130 to the back pin. I tried make an easy comfortable swing with the 9-iron, but pulled it slightly and the ball landed pin high but plugged in a bunker lip. This was a gnarly spot to be and I didn’t really know what to do but to try and blast it out. I got very lucky and the ball popped out and also ended up just 12 feet from the hole. It was a straight putt and I made it for the par. Hole 14, par 4: A bit longer dogleg right hole. I hit a good driver but it rolled into the right side rough. I had 146 yards to an elevated green, but felt like 8-iron was the right stick so made a full swing and drew the ball around some trees ending up just 10 feet from the pin. I read the putt for about a minute then made a good stroke and it fell for birdie. Hole 15, par 5: A fun par five with water on the approach shot. I hit a decent drive that ended up in the right rough about 240 yards from the pin. To clear the water I needed to carry it 200 yards. I decided 3-wood was the stick rather than laying up and playing safe as I was feeling it today. I hit a good one that plugged about a foot from the green. It’s a huge green with quite a bit of undulation and I made a good chip, but it checked up a hair more than I thought leaving me 12 feet of putt. I read some left to right break and made a good stroke but the ball kept its line and lipped out on the high side. Tapped in for par. Hole 16, par 4: Another fun hole that doglegs 90 degrees right and a driver can go long into the water past the fairway. I hit a 3-wood right down the middle and had 104 yards remaining. I let the wind get a little too much into my head and since it was slightly behind me I decided to hit an easy 54 degree and let the wind take it. It landed a bit short and then, to my surprise, spun back about 15 feet. I two-putted from 25 feet for par. Hole 17, par 3: 150 yards over water into the wind. I hit a 7-iron as I thought the wind would knock it down but the ball landed 45 feet past the pin. I gave it a little too much umph. Two putted from that distance for par. Hole 18, par 4: I really wanted to shoot a 32 at this point. Really wanted it. I hit a low drive down the middle and ended up with 140 yards remaining. My irons hadn’t really been directionally “on” today, but I thought an easy 8 towards the pin would be simple enough, definitely a better idea than going after a 9. But… I made one of the worst swing of the day: didn’t post up, rotated way too much through the swing and shut the face. Everything was not well with that swing, by any means. I pulled it to the right about pin high, but also 10 yards off the green. I hit a decent chip that ended up 4 feet from the hole, but with a little downhill slider of a putt. After reading it for a bit I hit a soft little tap that didn’t break quite as much as I thought and rolled right past the hole. Had to knock it in for a bogey. Despite the small mishap on 18, I am still very proud of the back side today. It took me from a disappointing 41 on the front to my best Riverside round to date 75. A similar thing happened score-wise yesterday. I shot a 43 on the front of a different course then got it together and carded 38 on the back. Not nearly as fun as today, but it is making me wonder what I have to do to score better right out of the gate rather than wait until I have to pull myself together. That is what I will work on figuring out next. I have a feeling there is some good visualization drills out there that can help get things started on the right foot. I’ll be working on that and getting my irons back in check. 8 Responses to "Shot by shot round and a record in the books"
Great job dan keep up the good work. Congratulations! May it be the first of many. Make the tempo the same every swing. Thats how easy it is. This is a goal of mine as well. But I am planning to live to 95 instead. Great job, Dan! I’ve never thought about shooting my age on a side before. I’ve had par 36 before, but I have to get that down to 34 like you too. Luckily, I have until December!